Speaking at a news conference in Abuja yesterday, Oloyede said the results were released within 24 hours of the examination, adding that the remaining 80,889 candidates’ results would be released soon. 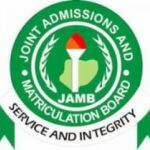 He said it was also a deliberate act by the board to withhold about 76,923 results dues to some alleged malpractices in some of the Computer Based Centres (CBT) where exams were held. “Six weeks into the registration, we harvested in preparation for the exam about 1.7 million registrations. “But so far, we have released the results of 1,606,901 candidates leaving us with a balance of 80,889. The registrar said that results would henceforth not be released immediately from 2018 unless every issue pertaining to the conduct of an examination had been thoroughly looked into which depict the international best practices. He added that results that had not been released would be released before the commencement of admission exercise. He also said that supplementary examination would be conducted soon for candidates who had hitches in the registration and examination processes. Oloyede attributed some of the hitches to some CBT owners and cyber cafe operators. “Anybody whose biometric could not be verified will be allowed to do the supplementary examination. “As at today, 640 candidates out of 1.7million candidates did not do biometric verification, reasons being that some fraudsters registered candidates across online. Mr. Oloyede, however, promised to introduce electronic jammers in subsequent examination to further reduce malpractices.